What a great store! I was really impressed by their wide selection of comfortable shoes and – let’s just say it – pretty shoes! From the awesome shoes to the charming, lovely (and knowledgable!) staff, I highly recommend my patients put in the travel time and check this place out. 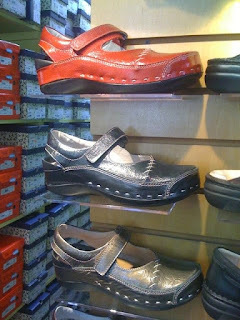 As all of my patients know, I am a huge fan of the Wolky shoe line and my favorite sandal of all time is the Wolky “Tulip” (which the Shoe Mill also has) but since not everyone lives in sunny Arizona – this is a great enclosed shoe for when the weather gets cooler. This shoe has a supportive sole with decent arch support, a wide toe box and good midfoot and rearfoot control.